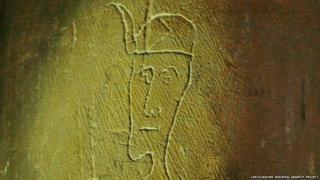 Image caption A head of a man was found etched into a wall of a church in Gonerby, Lincolnshire - but what does it mean? Medieval graffiti of straw kings, pentagrams, crosses, ships and "demon traps" have been offering a tantalising glimpse into England's past. What do the pictures reveal about life in the Middle Ages? A project to record the graffiti, which began in Norfolk, has now been rolled out to other areas and is gradually spreading across England. Armed with just a torch and a camera, a team of volunteers have recorded more than 28,000 images from churches in Norfolk alone and are a third of the way through searching Norwich Cathedral, where there are many more examples. Although the drawings discovered so far undoubtedly offer an insight into the minds of some - possibly bored - churchgoers in the Middle Ages, their precise meaning is not always clear. For instance, on the walls near the entrance to Cranwell Parish Church, in Lincolnshire, there is a figure identified as "the straw man". Brian Porter, Lincolnshire's medieval graffiti project co-ordinator, believes the figure to be a pagan fertility symbol, possibly etched before a May Day celebration. In pre-Christian tradition the "straw man" was made out of the previous year's crop and then eventually burned, with the ashes scattered across the fields. Mr Porter said he believed the church "couldn't stamp out" the Pagan traditions of parishioners and probably grew tired of rubbing the graffiti away. It raises a tantalising prospect. Could it be that beneath the Christian veneer, an older tradition was still being actively pursued, perhaps in a deliberately subversive way? Matt Champion, a medieval archaeologist who began the project in Norfolk in 2010, says there are a variety of different theories and care is needed when interpreting the drawings. "Brian could be right," he says. "But we have different perspectives. To be honest, I've yet to come across a genuine pagan symbol. Not all [Christians at the time] were closet pagans." Mr Champion said he was surprised by how much graffiti had been found so far and the way in which the project had caught the public imagination. Churches are being searched by volunteers in Suffolk, Kent, East Sussex, Surrey and Lincolnshire and the scheme is set to move into Nottinghamshire and Derbyshire in the near future. "[Medieval graffiti] was believed to be rare - turns out it's not," he says. "It's a fairly new area of archaeology and it's like discovering a medieval library buried in your back garden." Other significant images found so far include a picture of a ship found at a church in Bassingham. Dating from the late medieval period, its well-executed design means it is one of the finest examples found so far. The ship, and many other medieval examples identified at sites including Blakeney, in Norfolk, could have been created as prayers or an expression of thanks to God, says Mr Champion. "Are they thanksgiving for a voyage safely undertaken, or a prayer for safe passage on a journey yet to come?" he says. "Some of these ship images appear to show deliberate damage, begging the question whether they are prayers for long overdue ships. "I guess we will probably never know." Whereas in the modern era graffiti is often considered destructive and a plain nuisance, in medieval times it was an "acceptable thing to do", according to Mr Champion. He said medieval graffiti had largely remained unscathed and only symbols of heraldry tended to be rubbed away. Compass-drawn designs are among the most common types of inscriptions recorded in medieval parish churches. In some cases they could be explained simply as a mason demonstrating to his apprentice how to use a compass. However, Matt Champion said while some may be related to the original sites of consecration crosses, others could have functioned as ritual protection markings, designed to ward off the "evil eye". Mr Champion said the medieval church was incredibly superstitious. "They believed evil floated around you and demons were waiting to latch on to your soul," he says. "The evil eye was something real." He explained that some circles could have been drawn to act as "demon traps". "It was believed that the demons that roamed through the earth were rather stupid," said Mr Champion. "They were attracted to bright shiny things and, should they come across a line, then their stupidity and curiosity would cause them to follow that line to its conclusion." Many symbols crop up time and again. Windmill symbols are widespread and could due to the importance of them as food providers, according to Mr Porter. Sundials are also common and are categorized as "scratch" dials - so called as they were carved by an inexperienced hand - or drawings of "mass" dials which were used in the middle ages to tell worshipers when the next service would be held. Mr Porter said all the scratch dials he had seen lacked the gnomon [the stick in the centre] and almost always appeared on the south wall of a church where the sun passes during the day. Perhaps not every image found is necessarily symbolic though? Could it be that many of them were simply the results of a parishioner doodling? "It's quite possibly just one of many motives for drawing graffiti," said Mr Porter. "It might simply be the case that we have yet to understand its function." He has been holding workshops to encourage more people in the hunt for medieval graffiti describes much of what he has found in Lincolnshire as a "wonderful mystery". "The more we look, the more we find," he said. "It's everywhere, it tells you what was going on in people's minds, churches were not always quiet spiritual places." "We want to record it before it's lost."